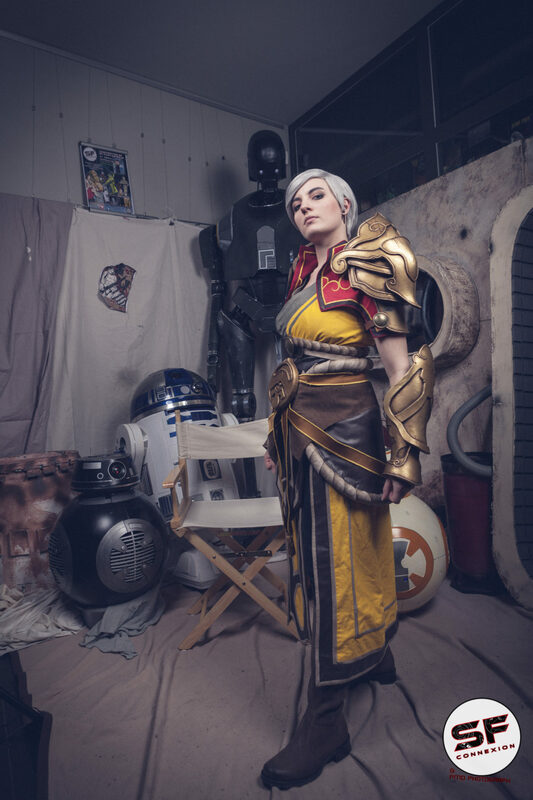 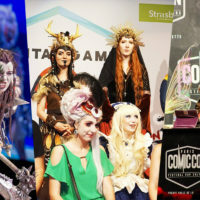 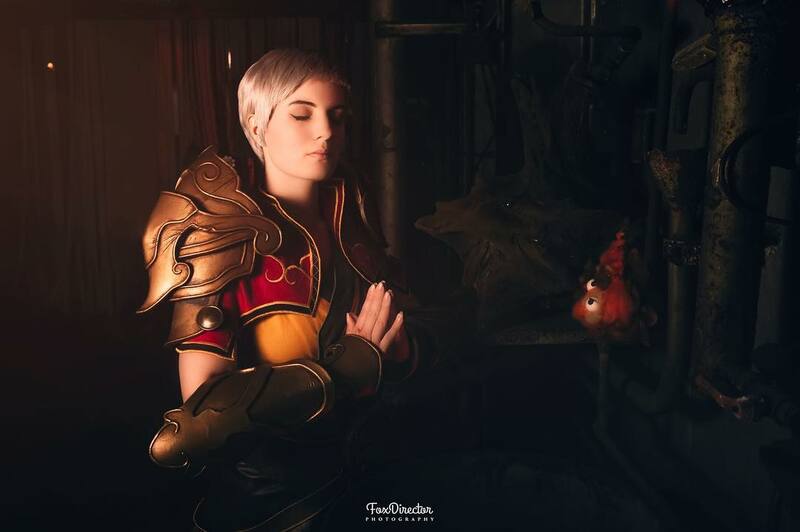 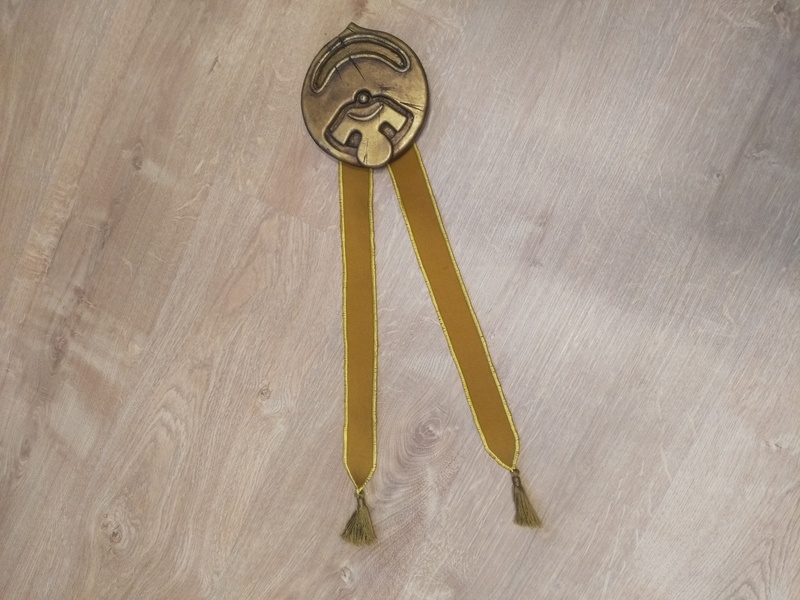 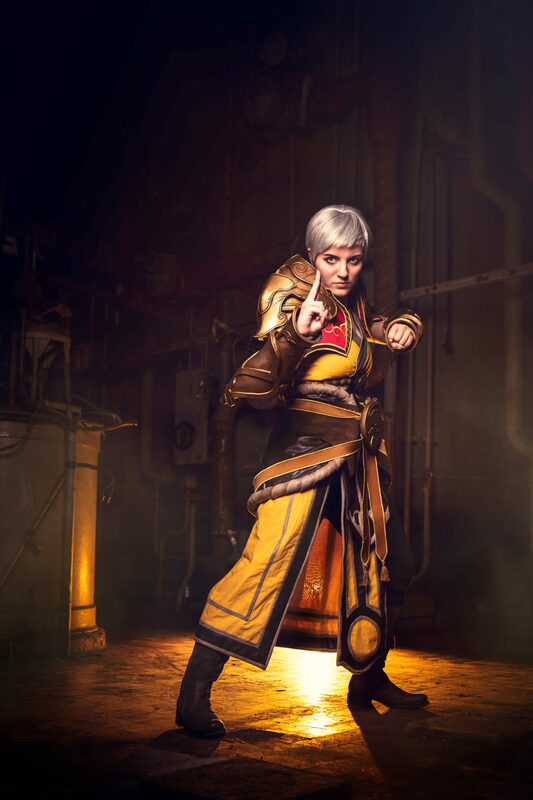 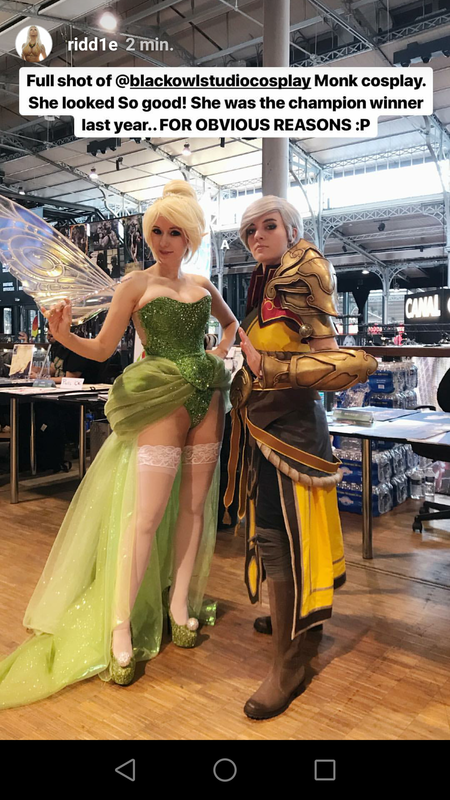 At the beginning, this cosplay was made for Comic Con Paris 2017 so that I could wear a «comfortable» costume (means that I can sit with it) while judging at the French Championships of Cosplay. 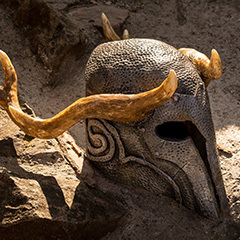 I got some additional pressure when I saw the other judges… Riki Lecotey, costume designer on Captain America : Civil War and Avengers : Infinity War (#nopressure) and Chris Donio, costume designer on Ant-Man (#nopressureatall). 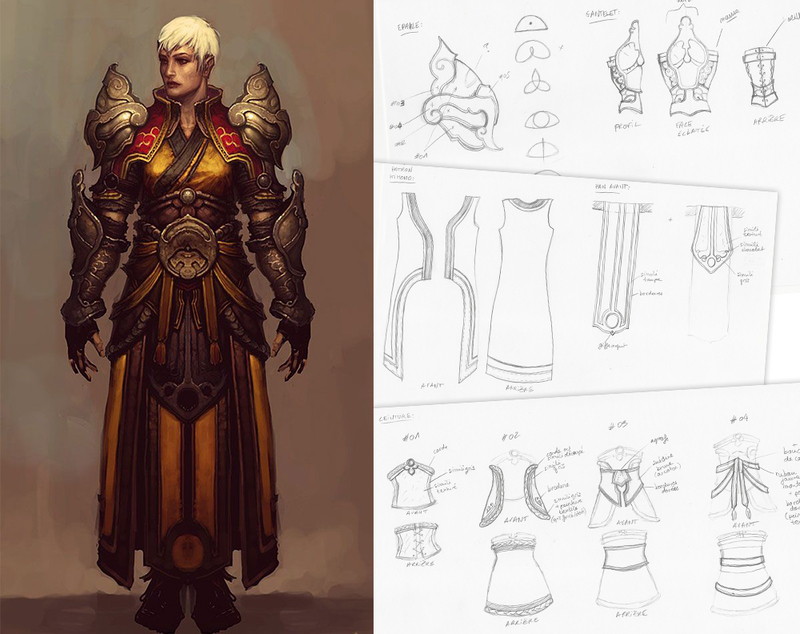 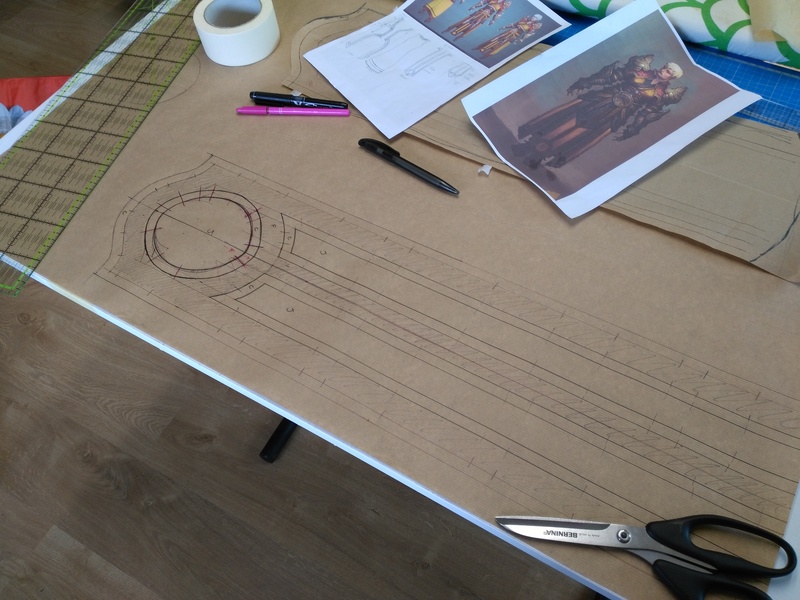 I re-drew most of the parts with different perspectives, and superimposed the layers step by step to better understand the overall composition of the costume and identify each piece. 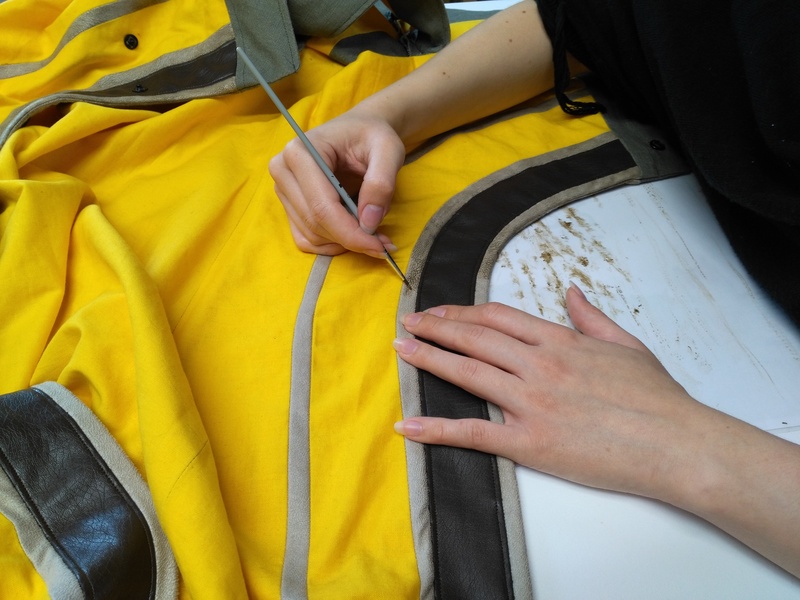 All fabric patterns were made by hand. 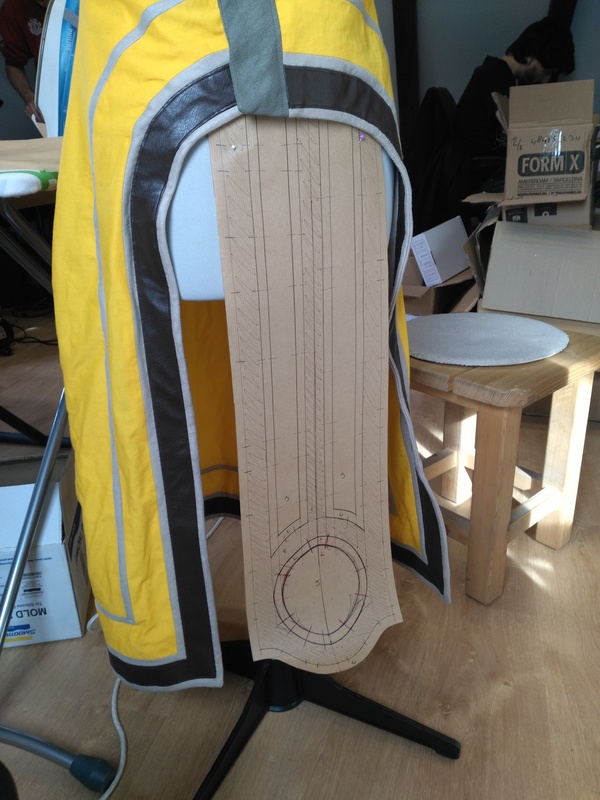 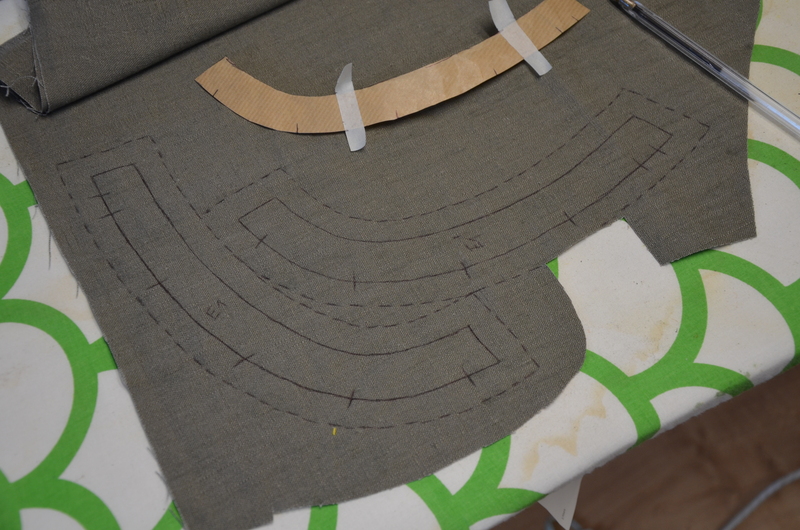 For most of them, I first drew patterns on kraft paper with a few quick measurements, which I transfered to a draft fabric (hurray for the old bed sheets !). 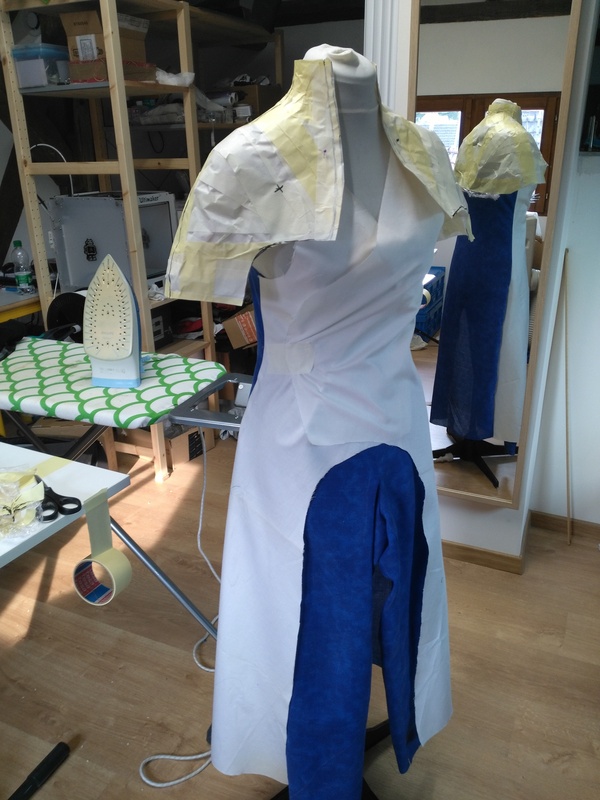 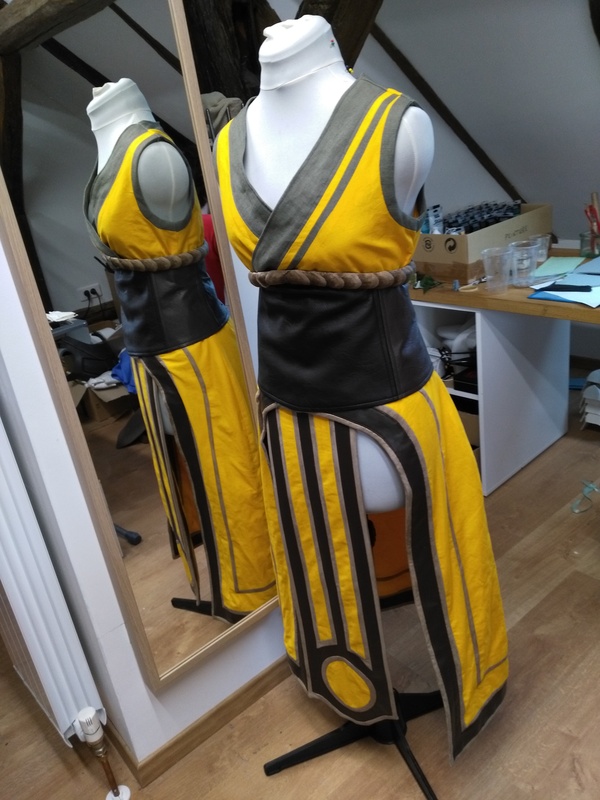 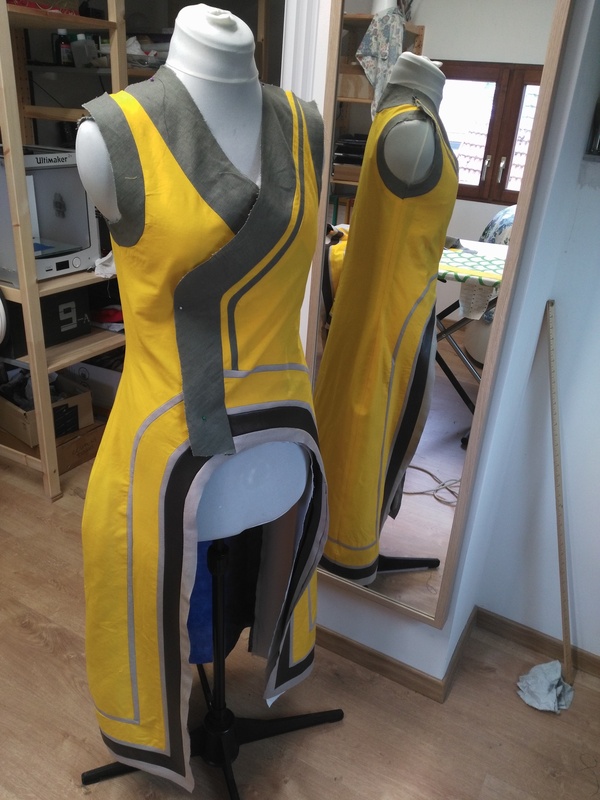 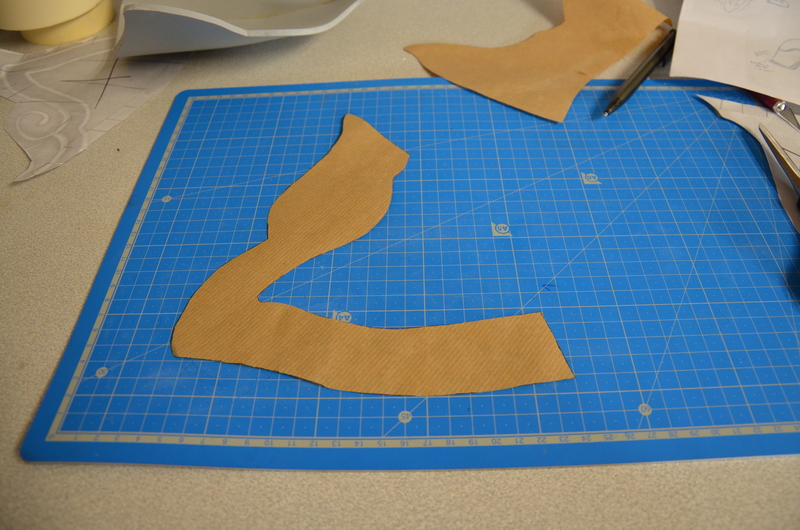 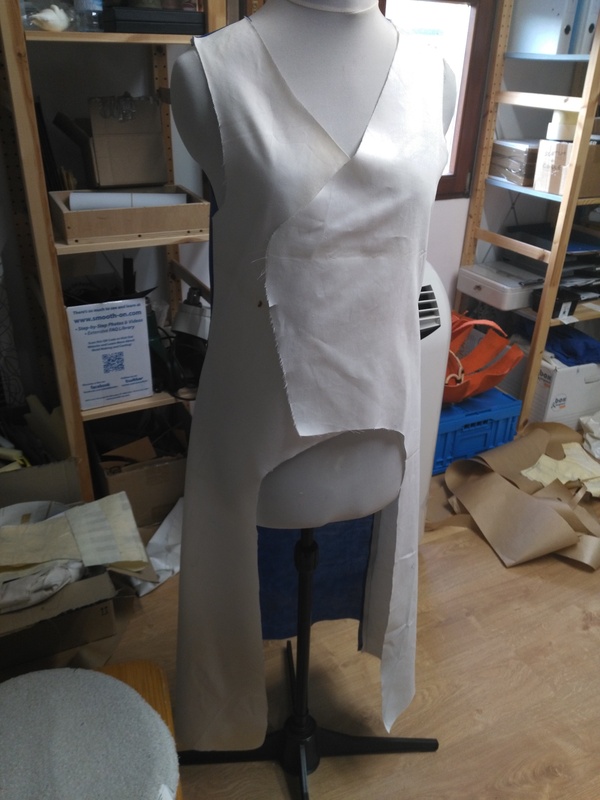 Once on the dress form, I cut some parts of it again to adjust it. 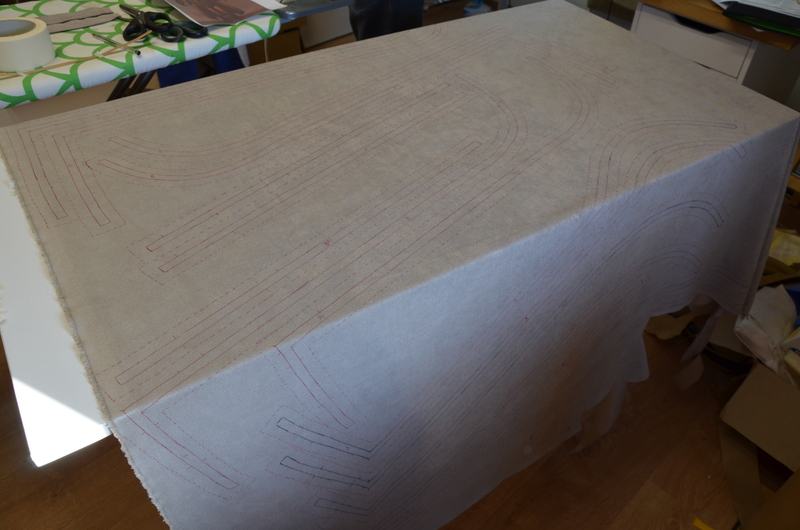 When I was ok with the result, I re-drew the fabric piece on my kraft paper while keeping the improvements. 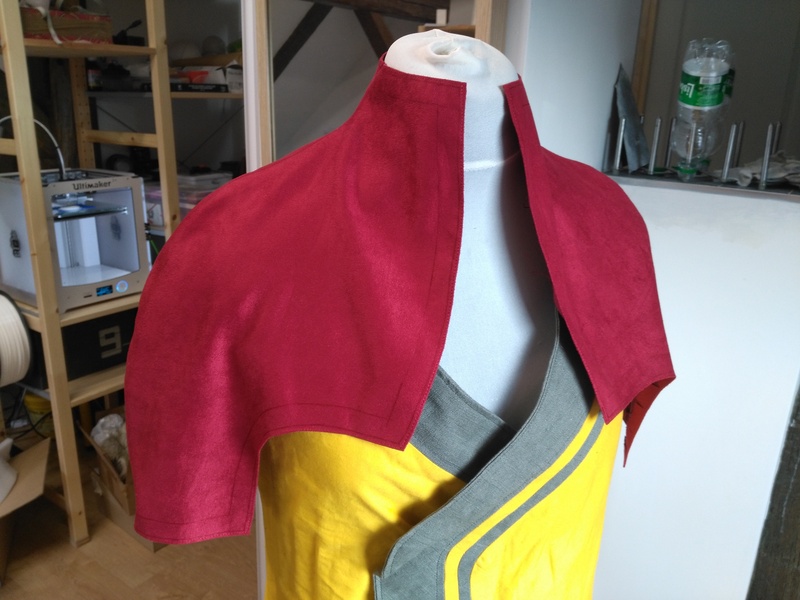 Some parts were made with the cellophane + tape method, that’s the case for the cape (see 2nd picture below). 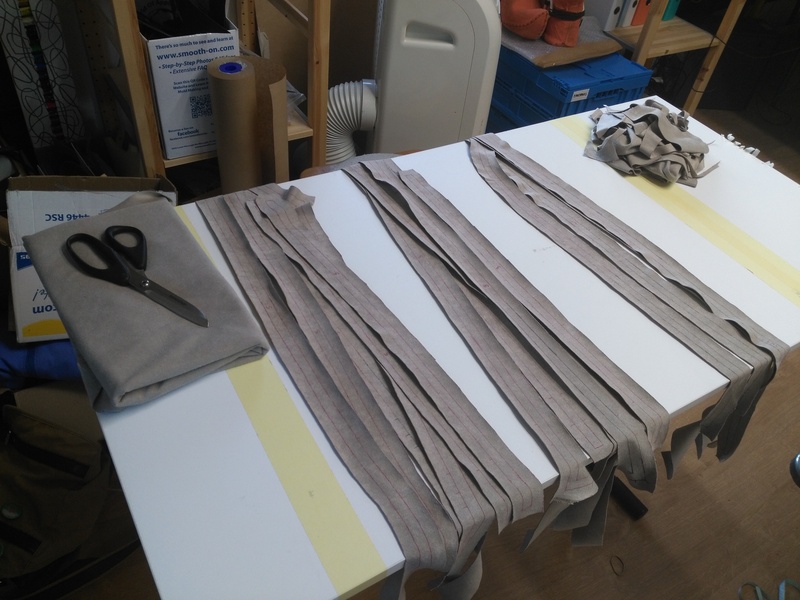 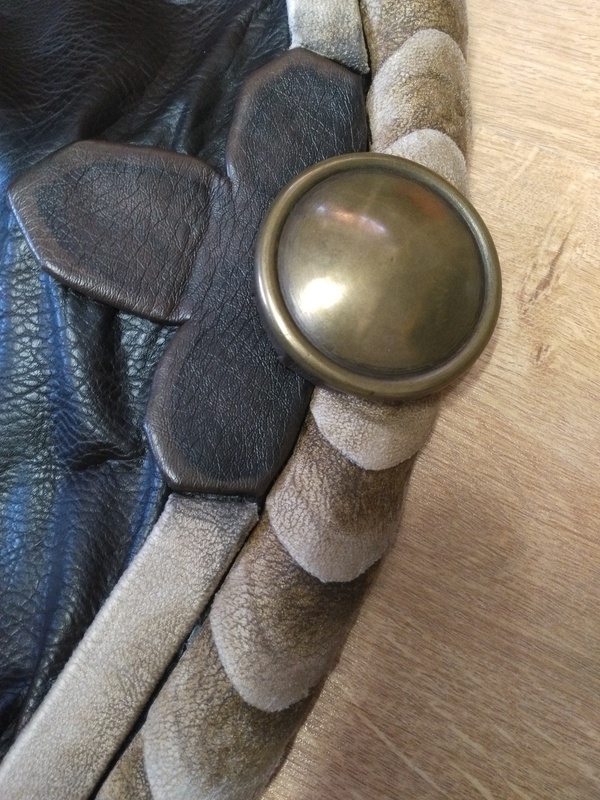 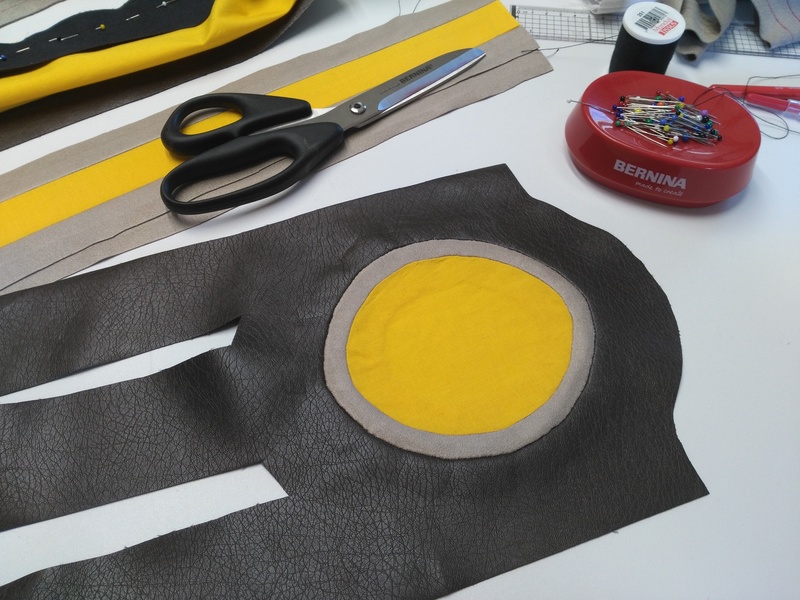 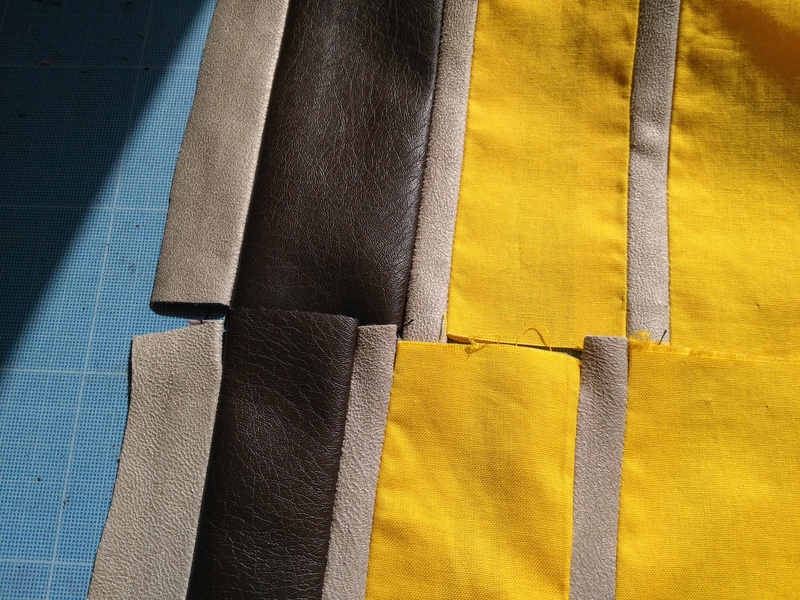 Patterns are transferred on the final fabrics, namely a nice yellow cotton, some mouse gray linen, a gray/beige soft-touch faux-leather, and a chocolate grained faux-leather. 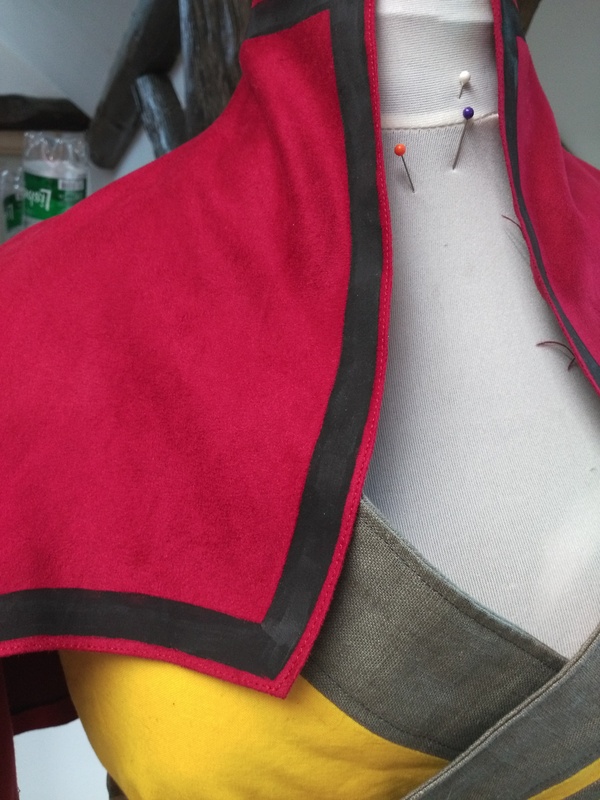 This kimono actually has many details with a lot of different fabric lines that cross each other. 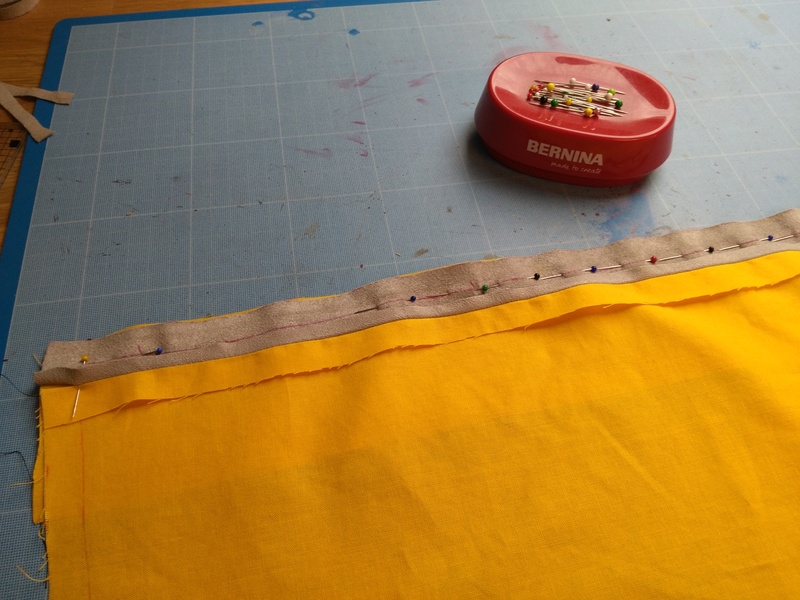 Borders made of several fabric strips, curves, and lining are everywhere! 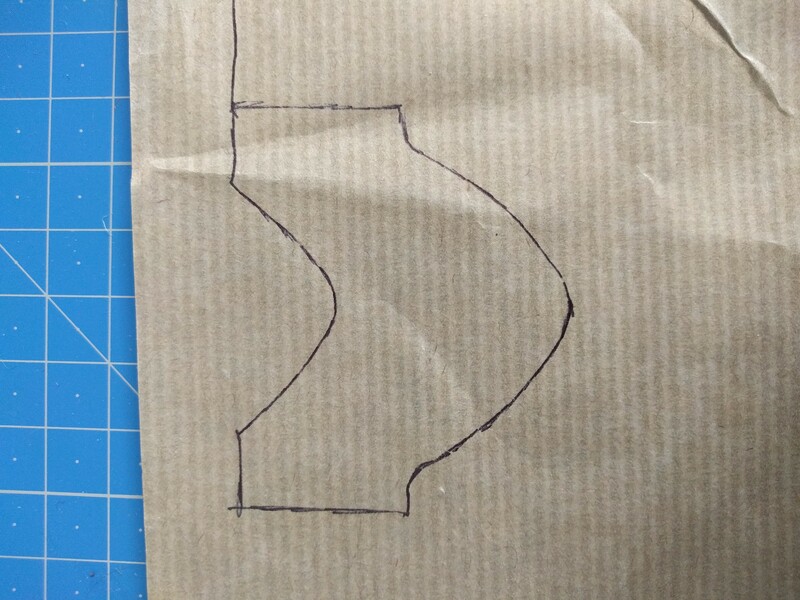 On the artwork, the pose is static with straight legs. 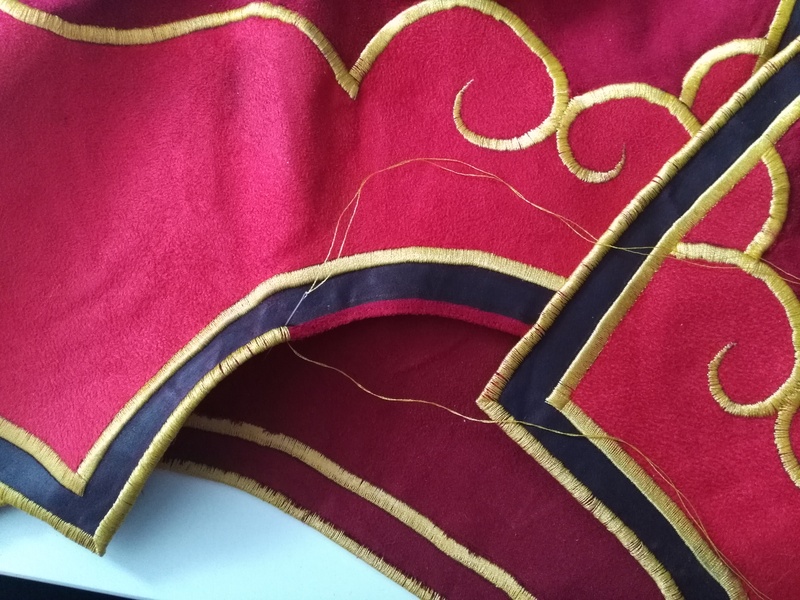 Yet, on a costume, you also have to be careful on how it looks while moving. 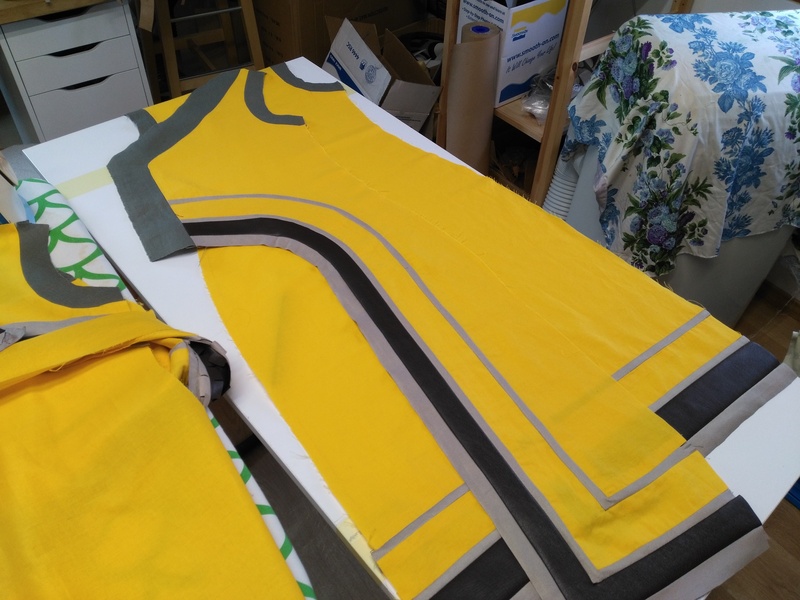 Considering the large opening at the bottom of the kimono, we can easily figure out that the lining will be often visible. 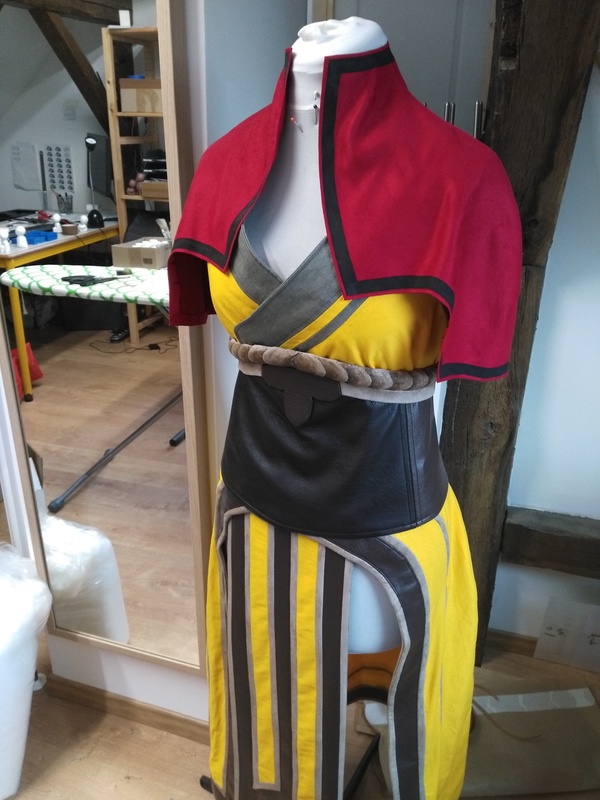 In order to remain consistent, we chose to duplicate the kimono, and it’s hellish borders, to have the same pattern inside (apparently we love to suffer). 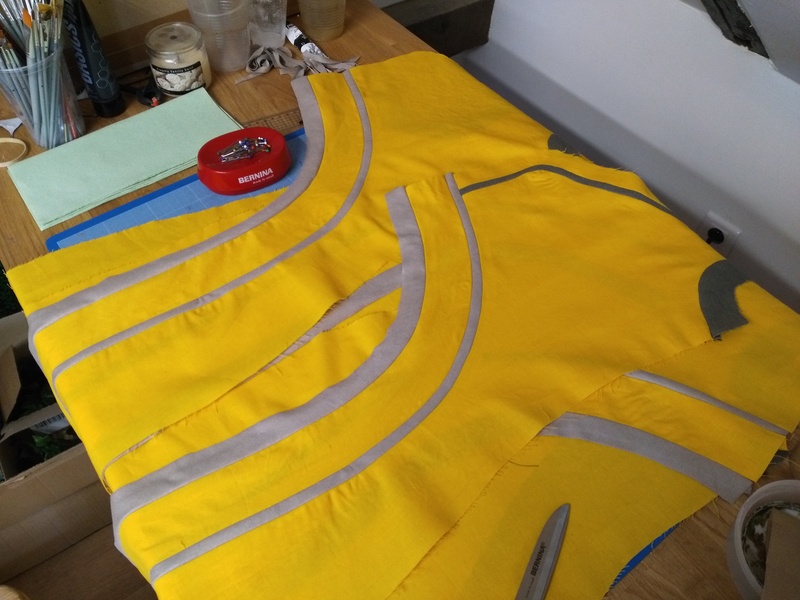 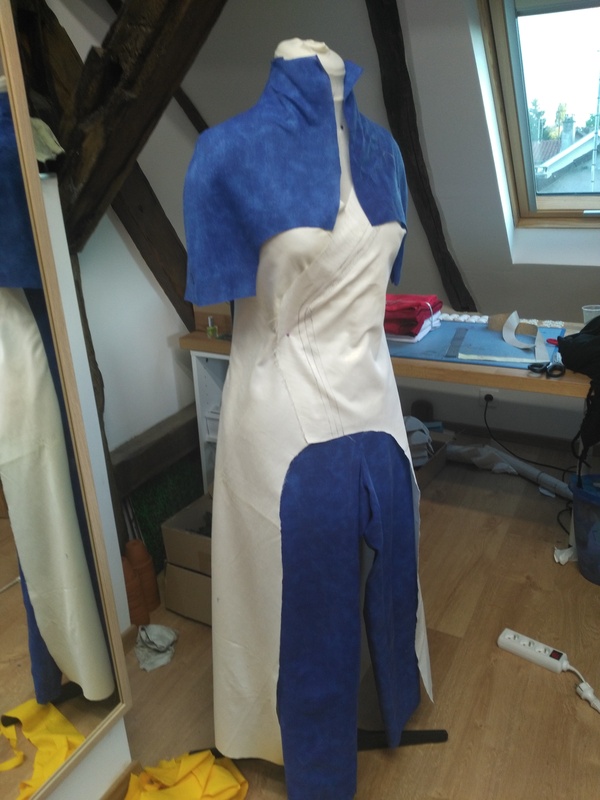 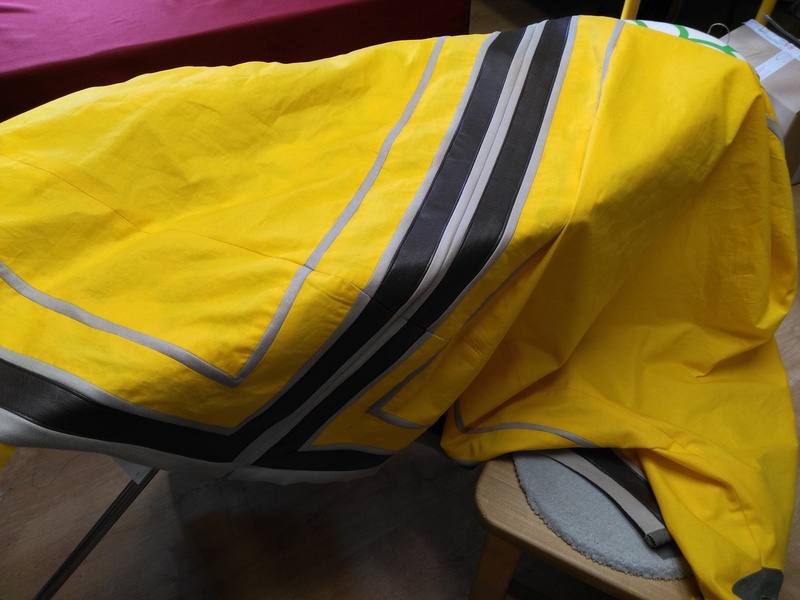 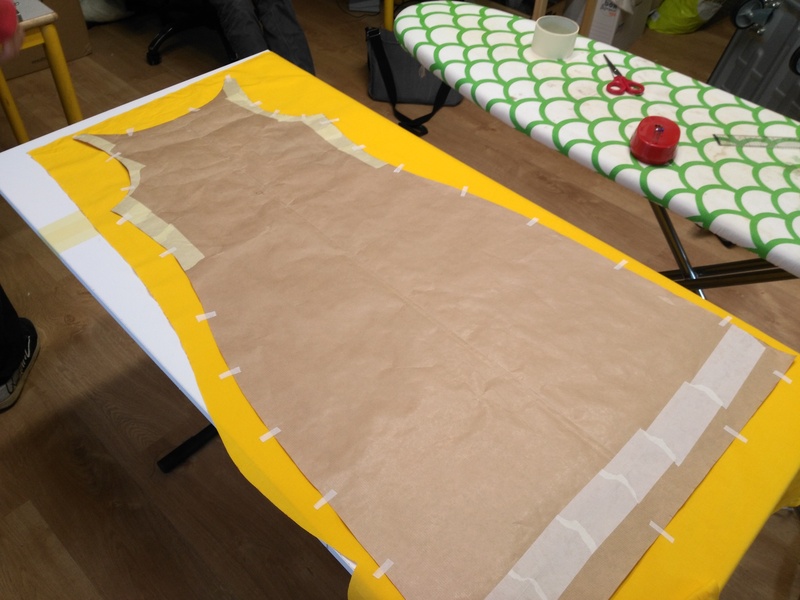 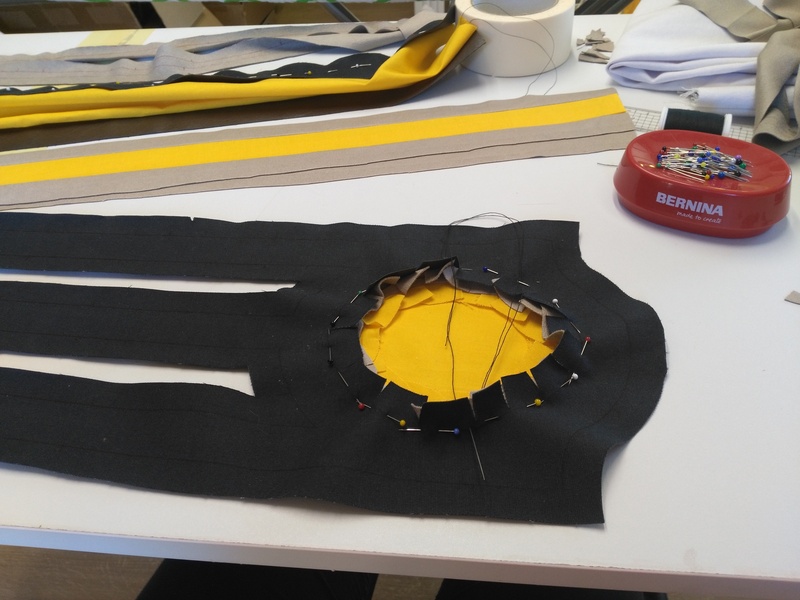 Once both parts of the kimono are assembled (external face and lining), it’s time to sew them together… and to topstitch all the seams with each other to prevent the kimono from looking like an hot air balloon. 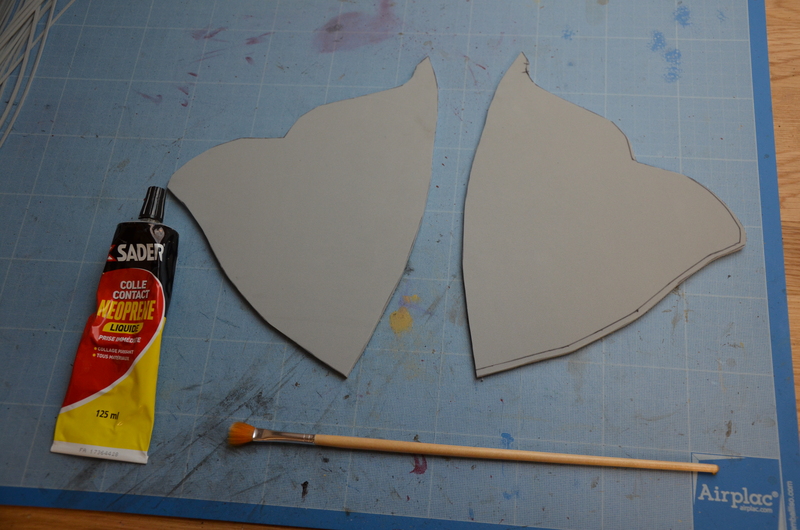 A bit of weathering to make the whole more harmonious and break the «new» appearance that I found too flat. 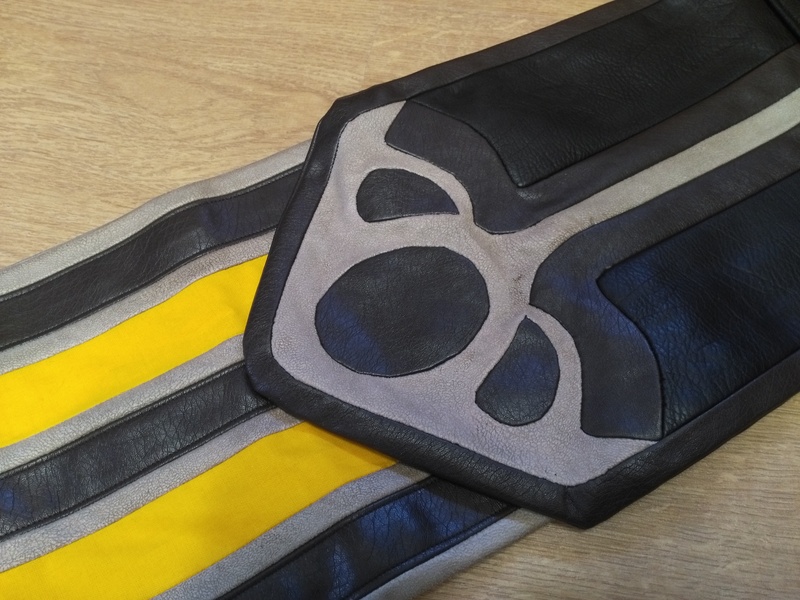 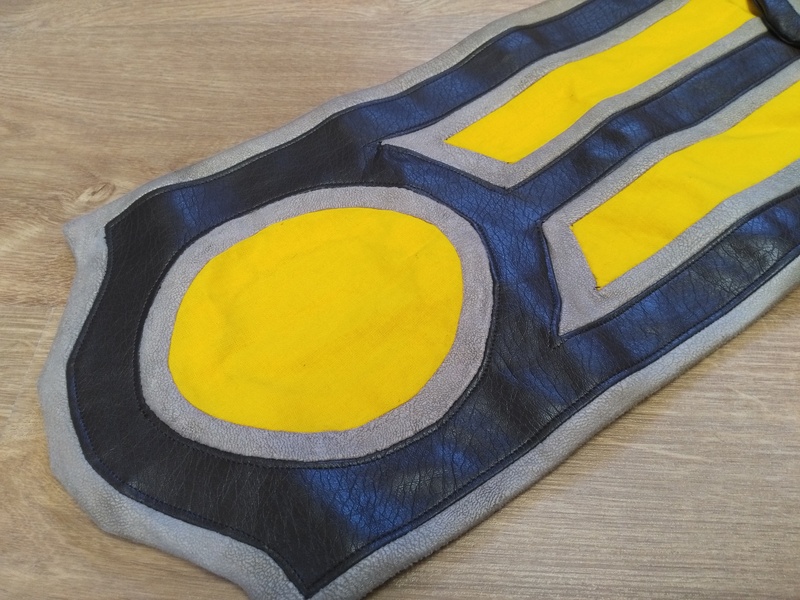 I darkened soft-touch faux leather borders with some diluted acrylic paint to add effects. 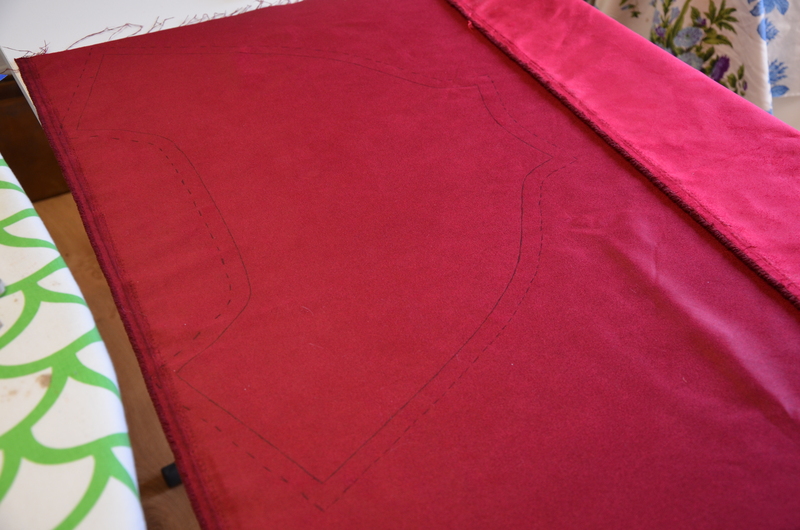 Same for the belt border, on which I made a gradient to give it more dimension. 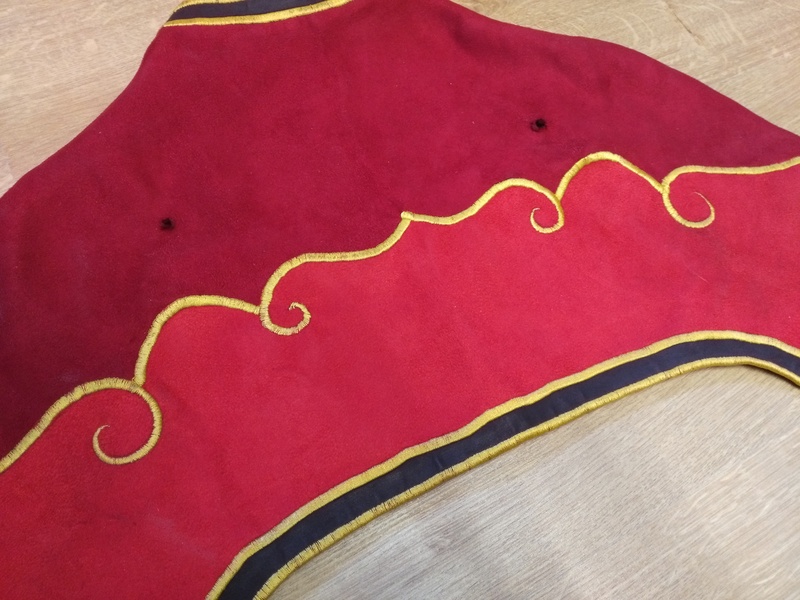 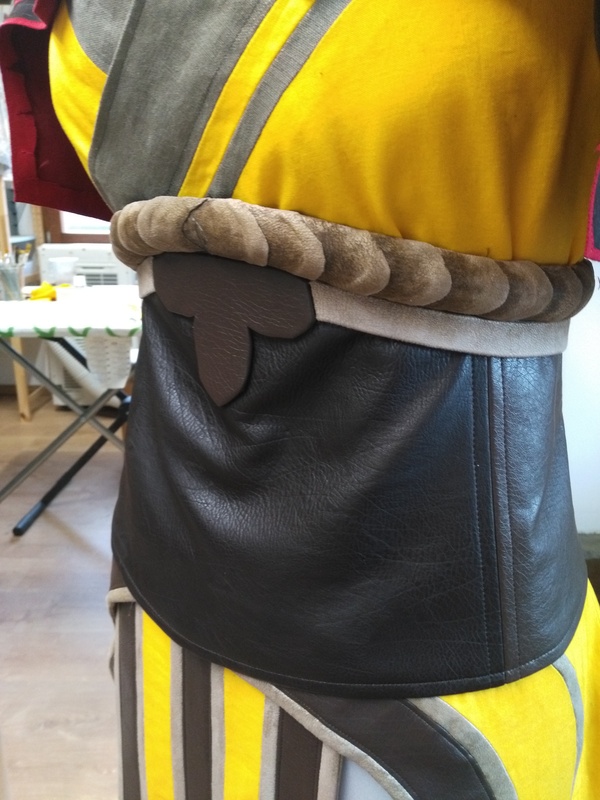 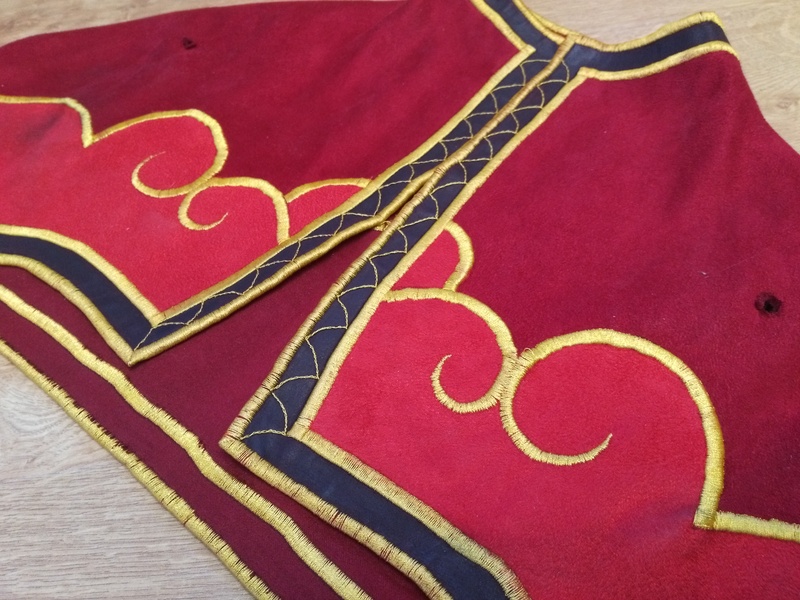 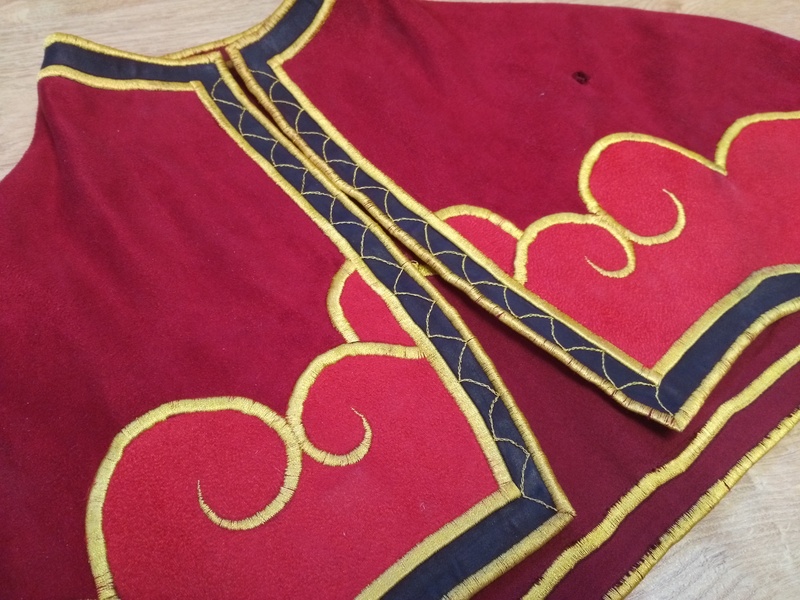 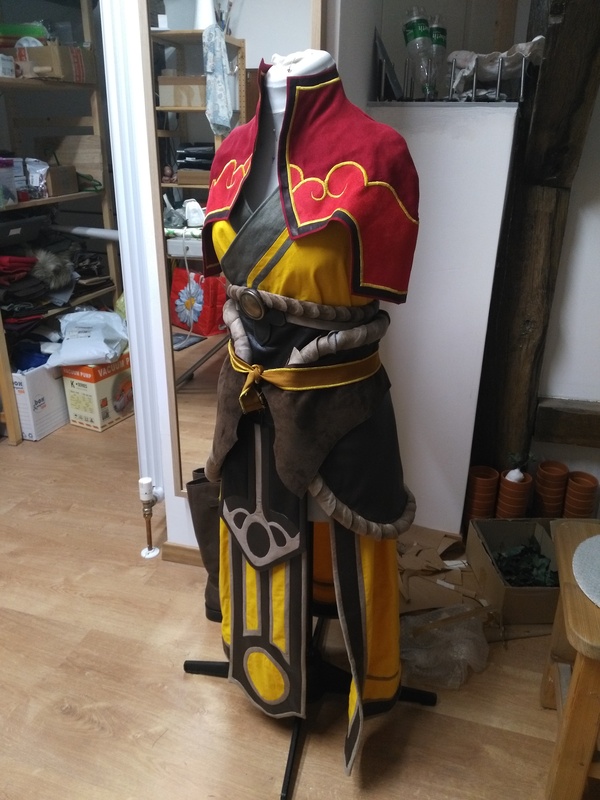 I started by assembling the cape shape with dark red suede, and painted a black border before thermobonding the pattern basis with lighter red suede. 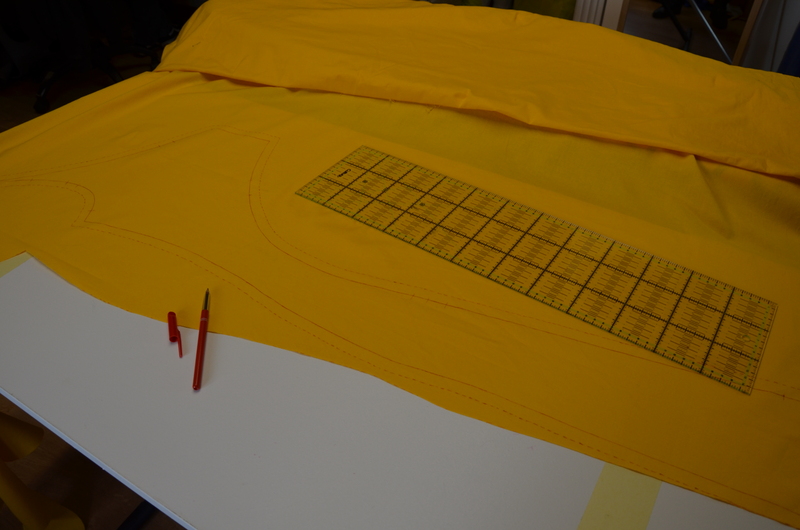 Then, the golden arabesques were made by mixing sewing machine and hand embroidery. 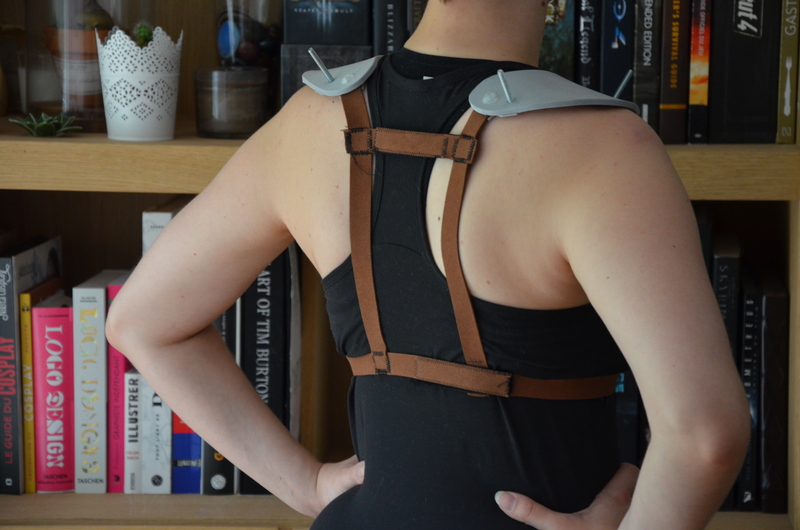 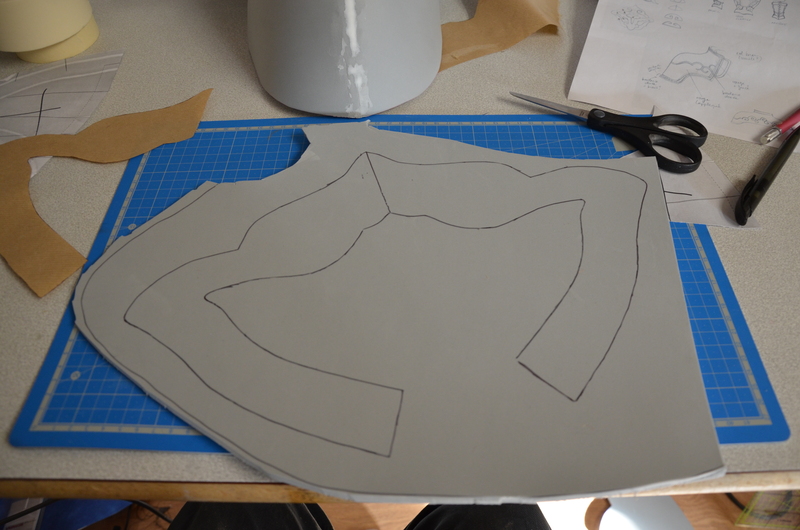 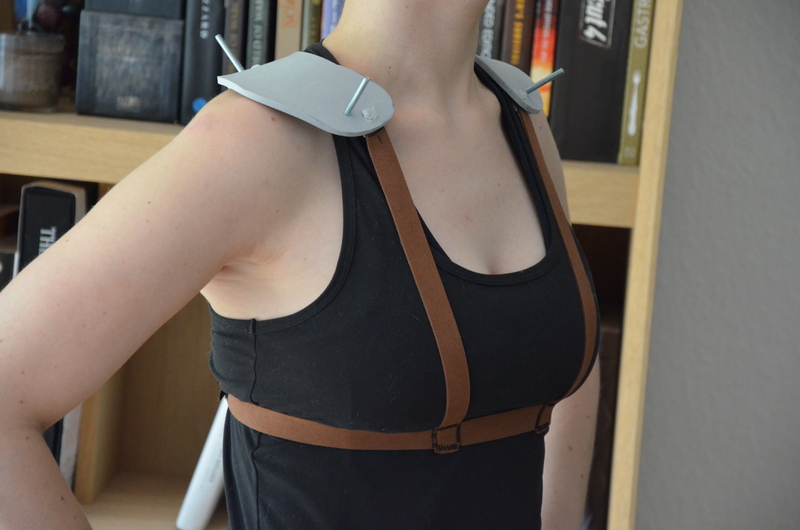 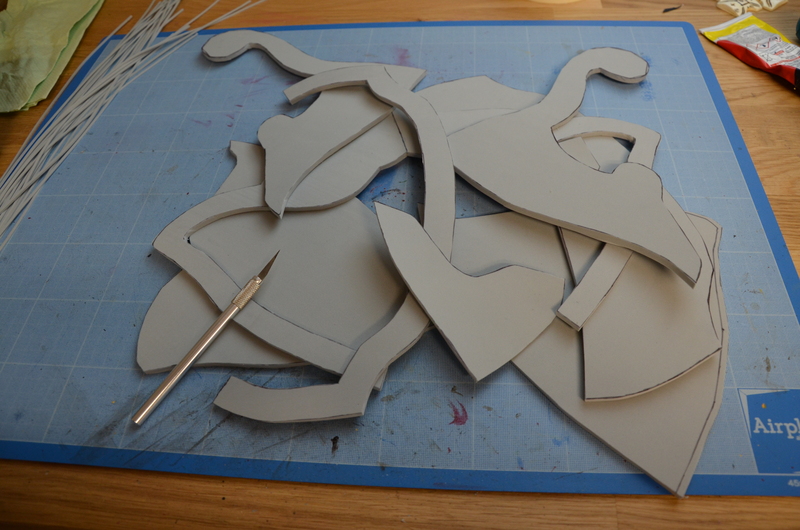 To attach the shoulder pads, we first made a harness with foam supports in which we glued screws (=pivot points). 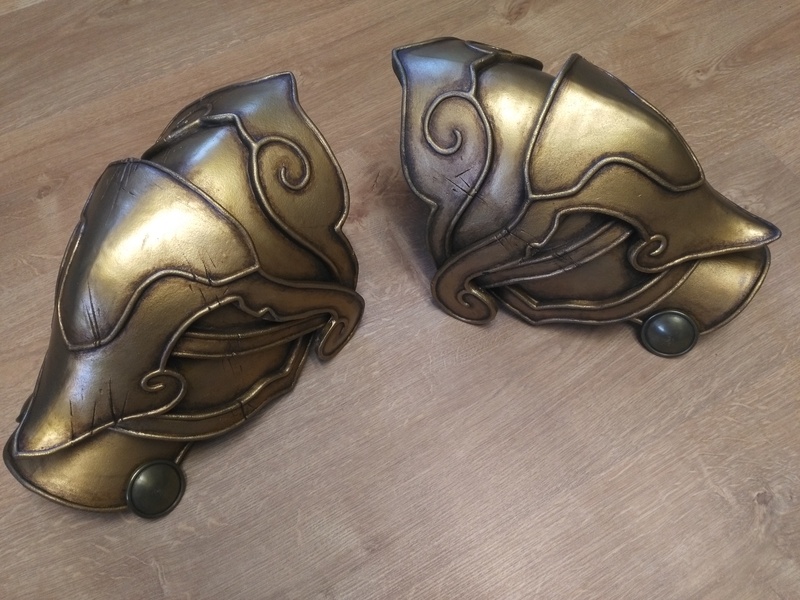 We managed to find a 3D model that nearly looked like the reference picture. 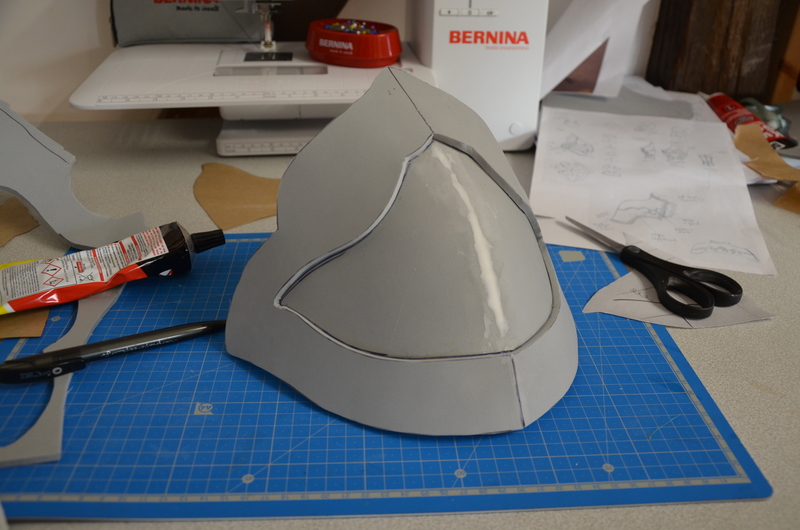 After some touch-ups to correct some edges and faces, fill the holes, etc. 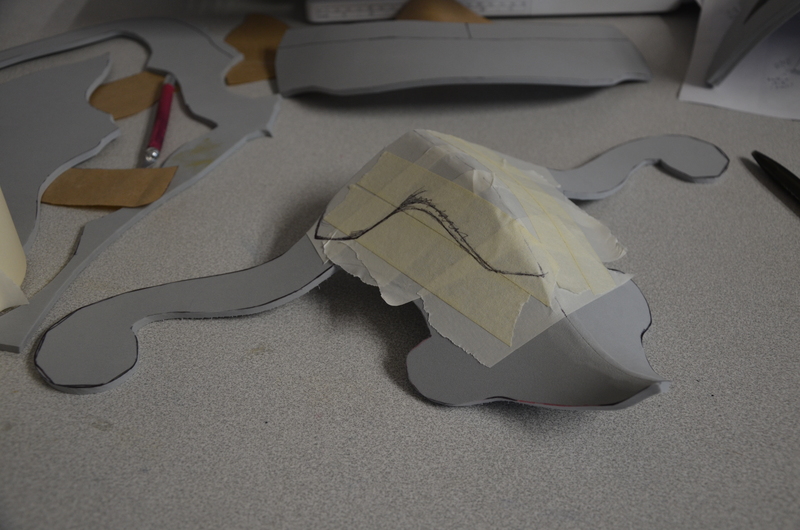 we imported the piece on Pepakura and with a bit of optimization work, got some nice 2D patterns. 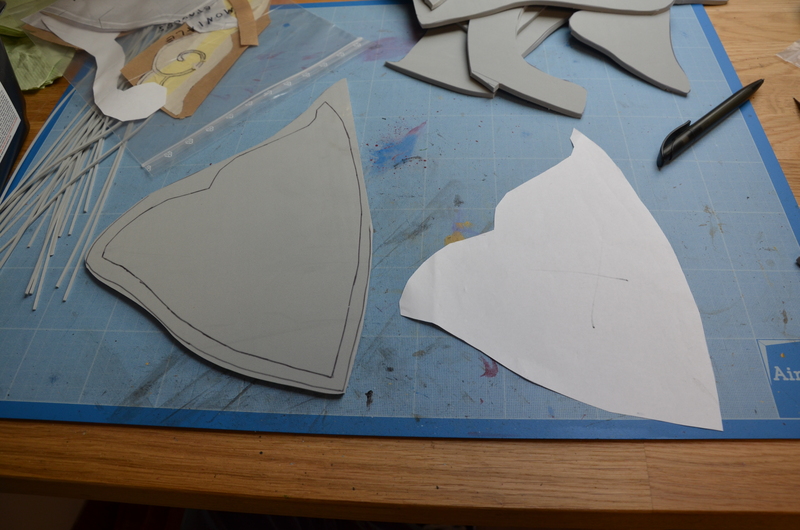 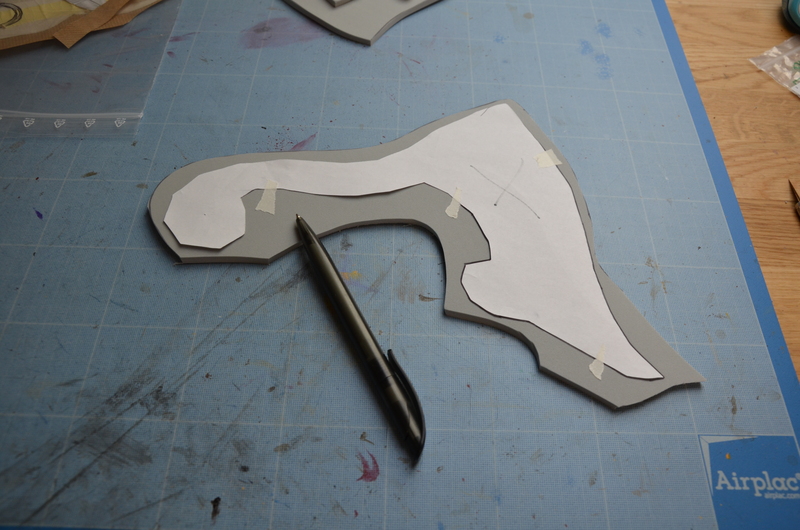 When the basic shapes were built, I used the tape method again to draw details and make the next patterns. 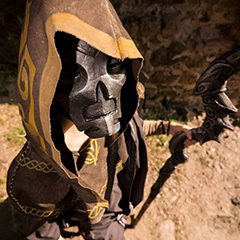 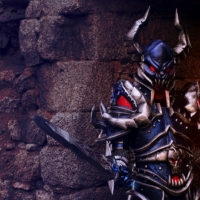 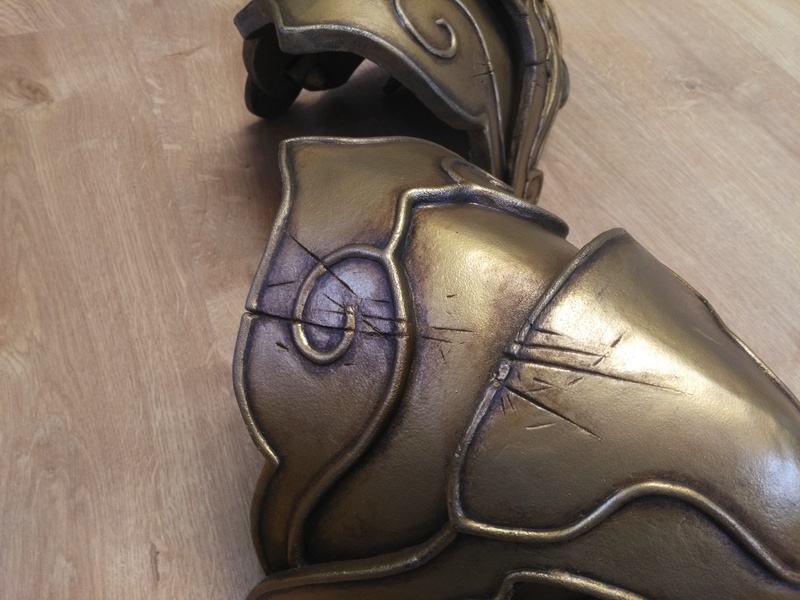 It was the first armor piece that we made entirely with Worbla’s Black Art. 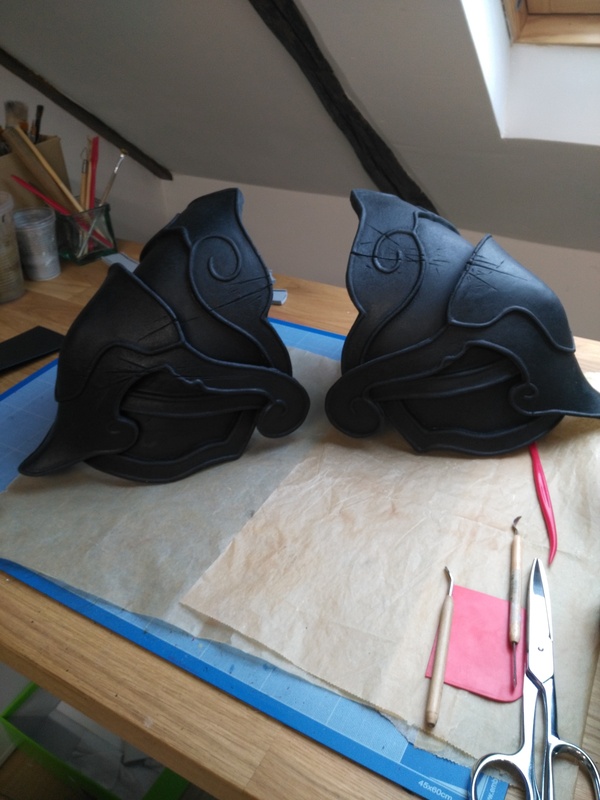 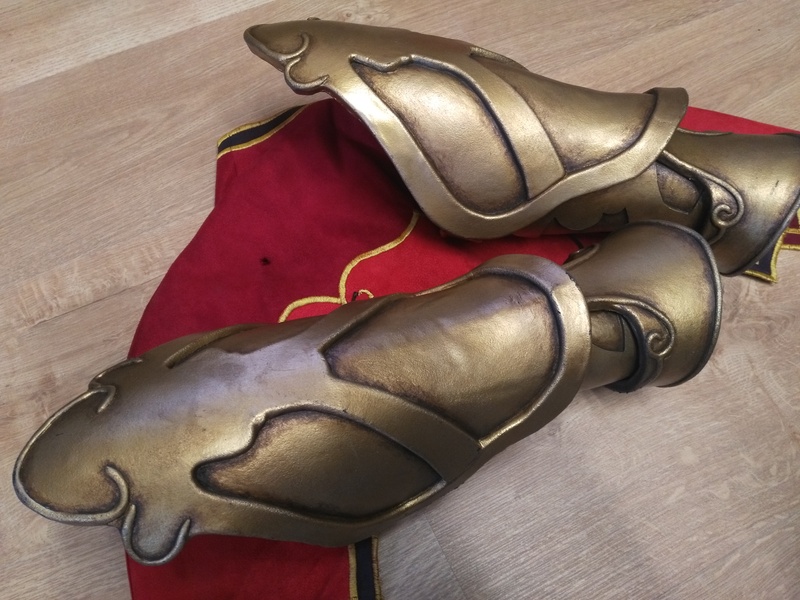 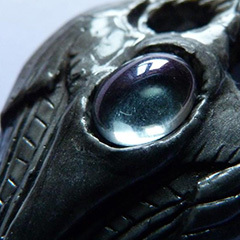 Although it’s smoother than its big brother (Worbla’s Finest Art), you have to be careful because the black version tears more easily. 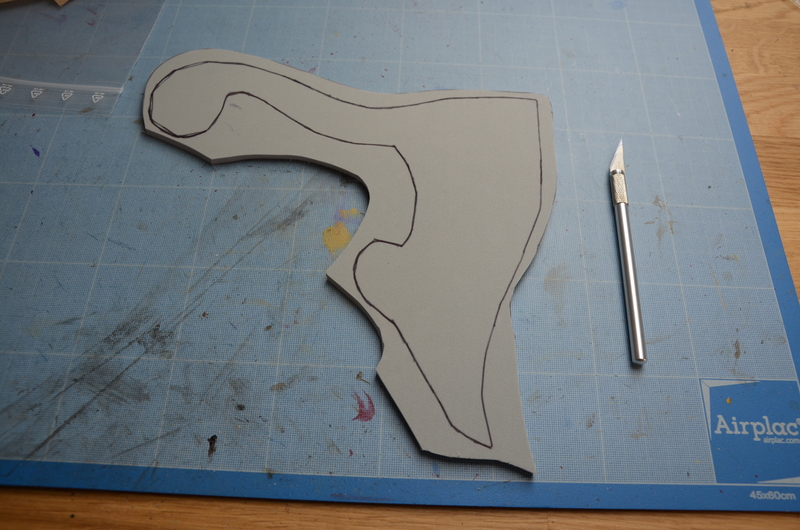 On a piece with lots of depth levels, it’s quite more difficult to work with. 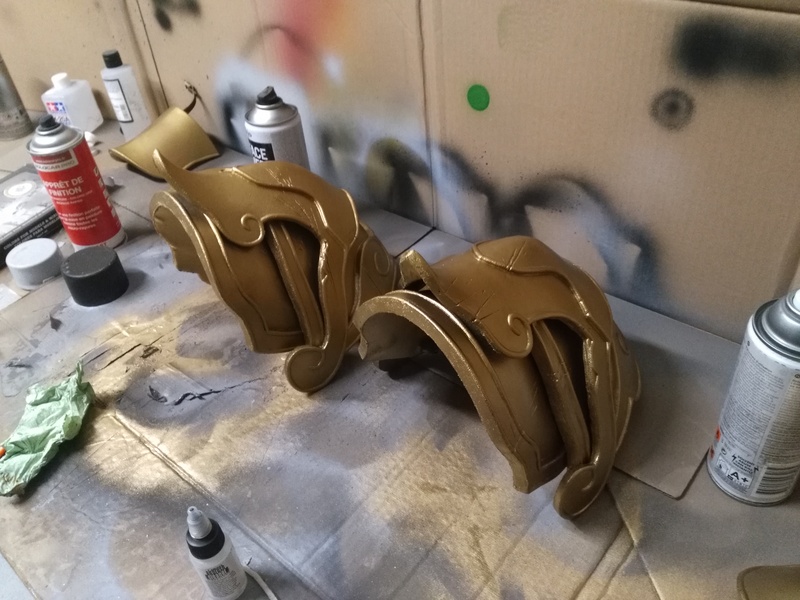 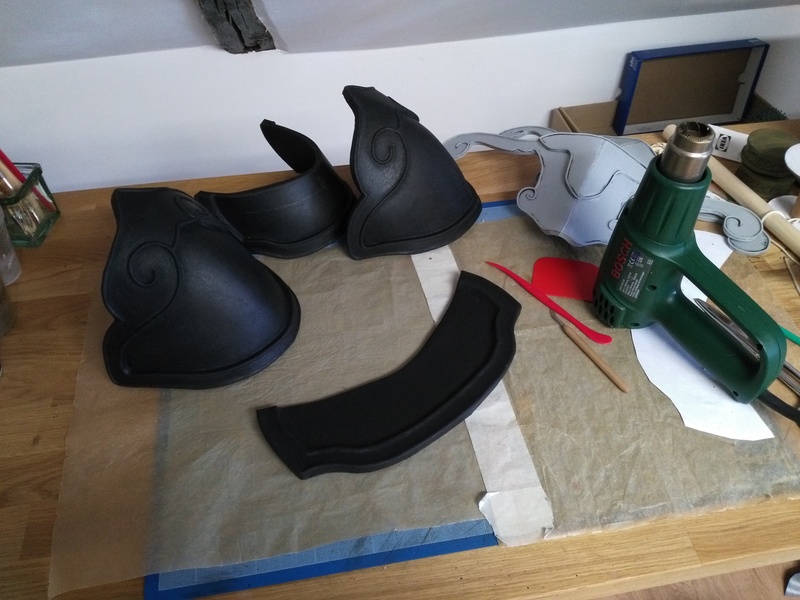 The final render is really smooth, and you don’t need to sand it too much (or not at all depending on the render you want and the primer you use), but I would not recommend to use the Black one on big pieces if you’re new to Worbla or thermoplastics in general (try on small pieces or use it for details at first). 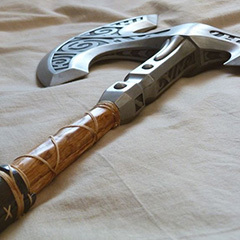 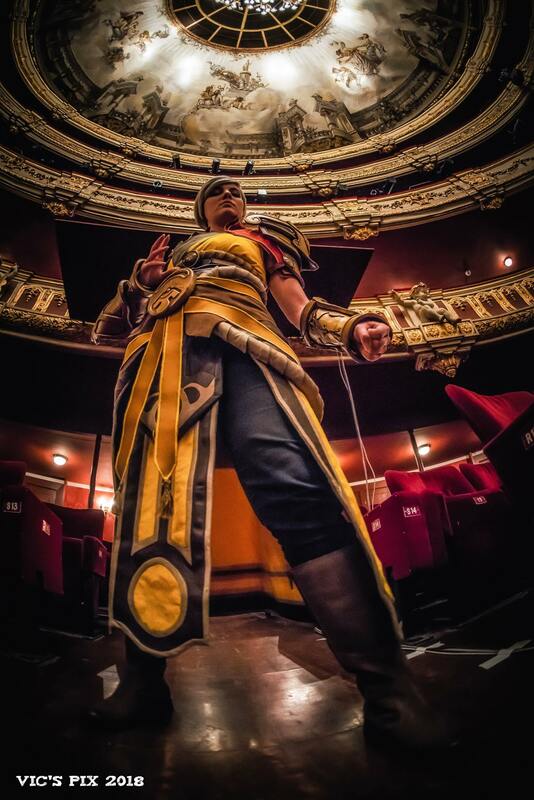 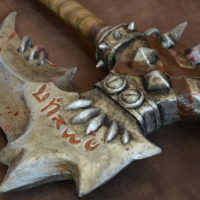 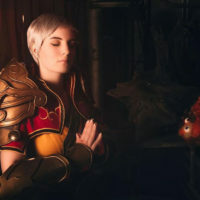 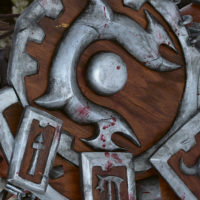 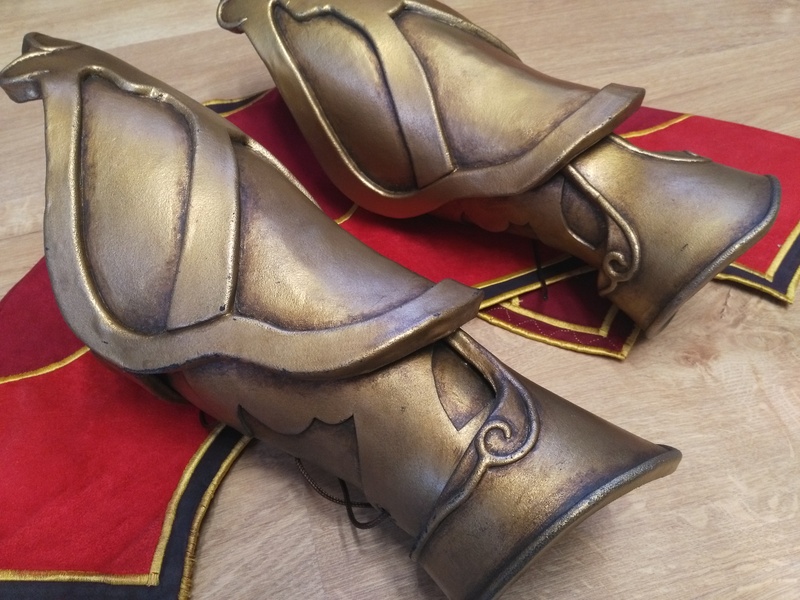 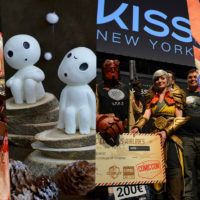 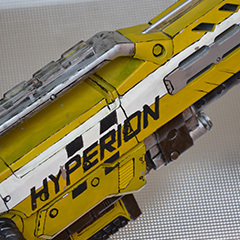 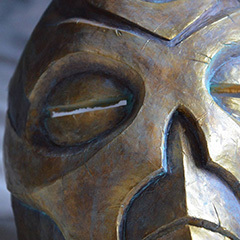 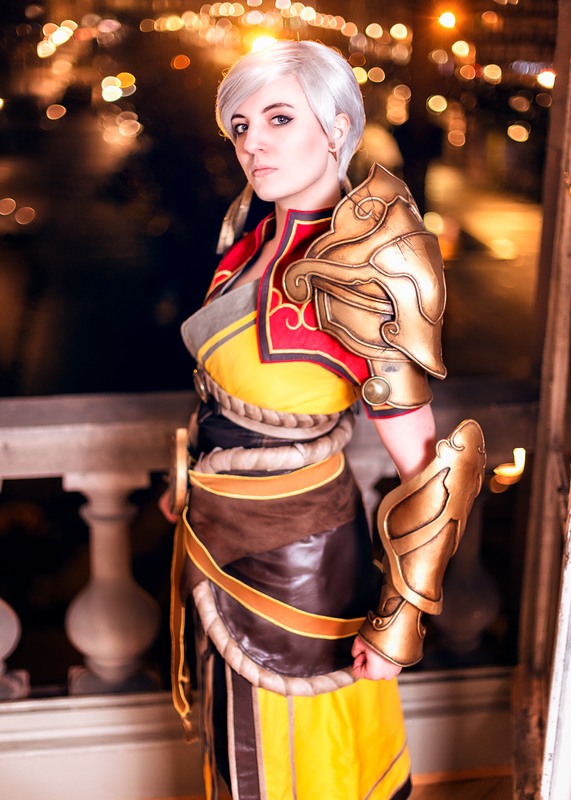 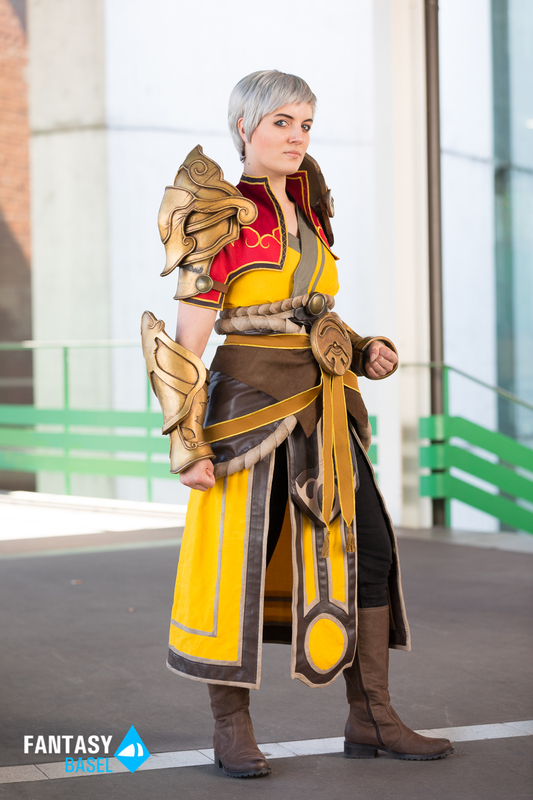 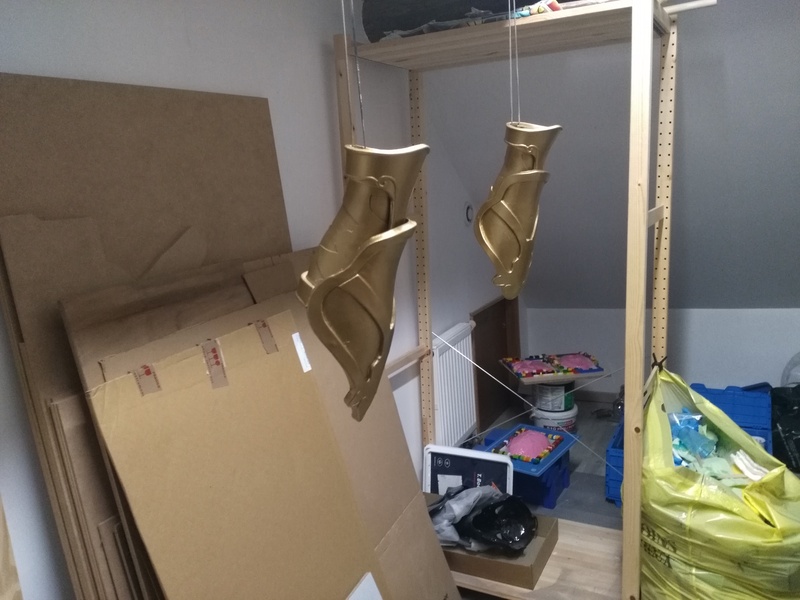 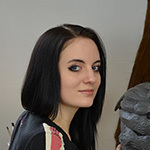 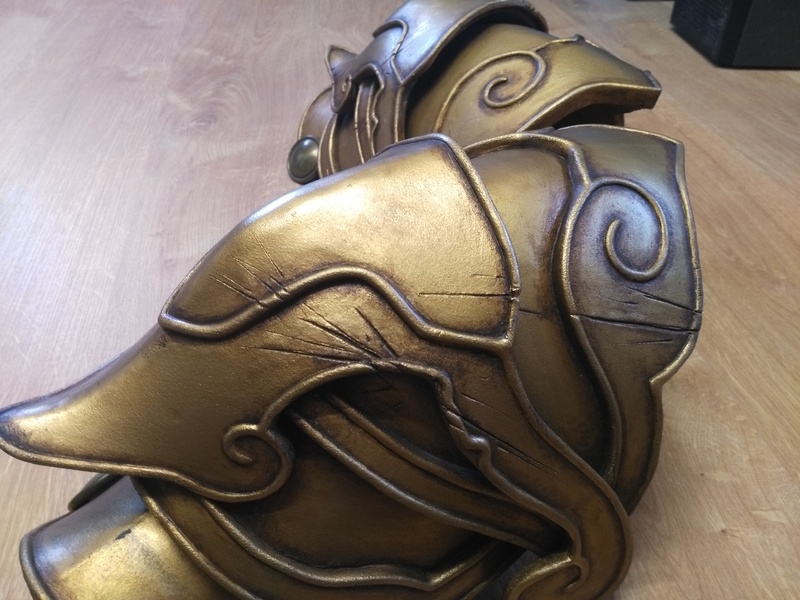 However, if you’re used to work with Worbla’s Finest Art, don’t hesitate and go ahead. 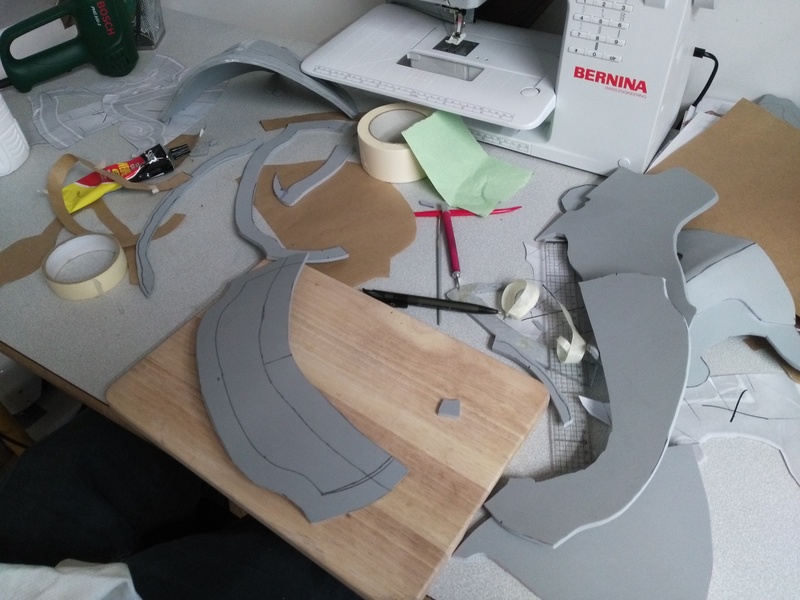 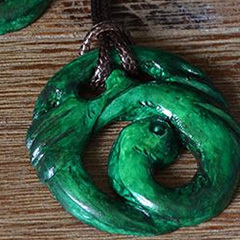 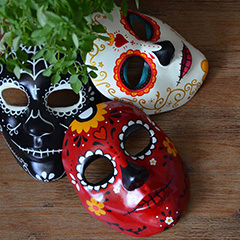 You’ll need to make some tests at the beginning to avoid tears, but once you are past this hurdle, you’ll gain so much time on the sanding process.